Wildwood makes it easy to accessorize with out convenient wood fired pizza oven accessory kits. 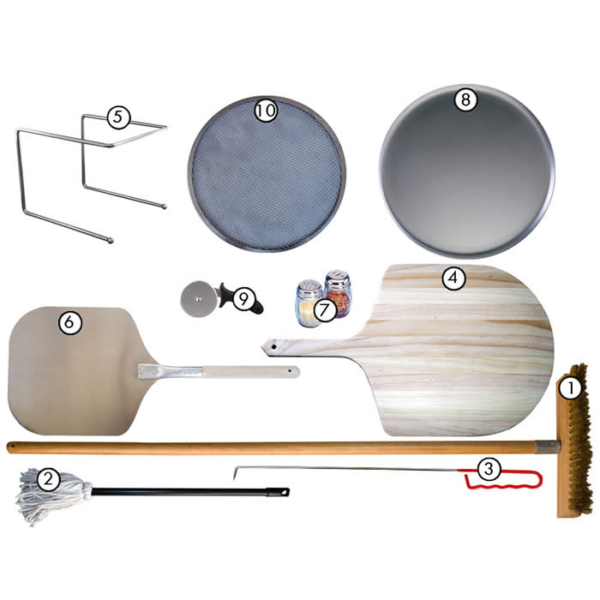 If you are just getting started with wood oven cooking, this a great kit for you! Every item in the kit has been selected by our culinary department as the “essential tools to have”. Wood Fired Oven Tools from Wildwood make it easy to cook pizzas. Everything you need to roll out a great dough, get it it the oven, and remove it when it is done. In addition you get great tools for maintaining you oven hearth in tip top shape! The number one must-have tool for operation and care of your wood fired oven. Soft brass bristles gently brush away ash and hot coals from the hearth. Used for general fire management. This tool has many uses. First and most obviously it can be used to pop the bubbles that form when baking a pizza in the oven. This tool is great for rotating and moving the pizza, and even works to help retrieve pots or pans that are deep in the oven. Number one tool for launching pizza and bread products onto the hearth. Made from high quality North American Hardwood. Fits all Wildwood door openings. Create more room on your table by elevating your masterpiece for all to see. Perfect for crushed red peppers, oregano, pizza seasoning, and grated cheese. Take your pizza right out of the oven and onto this convenient coup tray. Slice and serve your pizza with ease. This large pizza cutter with a 4ich blade and plastic handle glides through pizza with ease. Remove your hot pizza from the oven and place it on this screen for a minute or so and ensure that your crisp crust stays crispy and flakey.